Woods Piano Studio: Middle C, I See! When I was a teacher with a K-Plus enrichment program, there was a game that all the kindergartners loved to play over and over again: Spot-It. Spot-It is produced by Blue Orange Games and can be purchased on Amazon or at most retail stores. The object of the game is simple: be the fastest player to spot the matching picture or symbol between two cards and call it out. Whoever calls out the matching picture first is able to keep the matching card. The winner of the game is the player with the most cards. Spot-It comes in several variations, including Spot-It Sports, Spot-It Shapes, and so on. I have looked for a music variation as a theory activity in my private lessons, but it's not available yet. So, I decided to put my own game together! I started by creating a list all of the symbols on the original Spot-It cards, and then I substituted them with musical symbols. 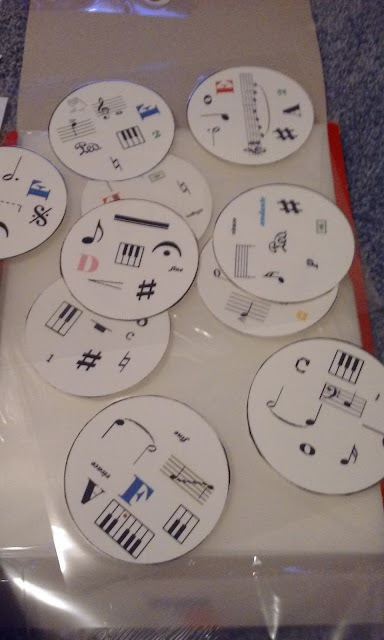 Since I will be using this game with my younger students, I chose symbols that should be familiar to them, and also included the letters of the music alphabet and finger numbers. Then, I created the cards using the Paint program on my Microsoft Windows computer (low tech!). I compiled all of cards into a word document, and printed it on cardstock. My husband helped me cut them out, laminate them, and then cut them out again! Sometime over the weekend, I'll go to my local Michaels and purchase a tin to hold the cards. We will play this game exactly as the original Spot-It is played. 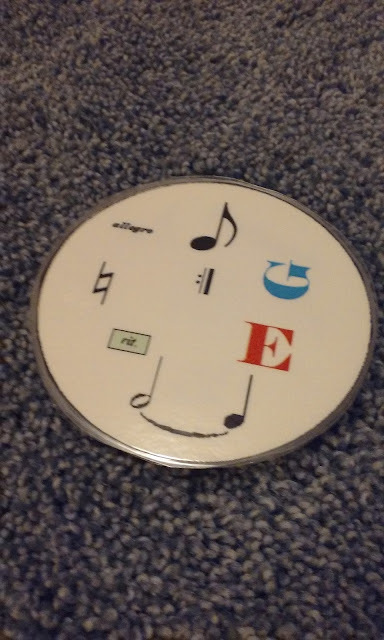 Based on the enthusiasm for this game that my kindergartners had, I'm sure that the intro to piano class and my younger private students will have a lot of fun with this game! EDIT: After multiple requests via email and comments on this post, I've decided to sell a PDF on TpT. I hope this game is as useful in your classrooms and studios as it has been in mine: Middle C, I See! Would you mind sharing a link to your file? Great idea! Is there a file available to print this? I would love to use this with my children. Is this a file you would be willing to share? Or at least tell the secret of how you got all the cards to match up... I love it!!!! Thank you all for your comments! =) I will get the PDF up as soon as I can! That must have been very time consuming. Thank you for allowing us to take advantage of all your hard work! I would love this! such a great idea! I love this idea for group class, as well. I would love a pdf! This idea is great! I'm looking forward to download the PDF file! This is awesome! Are you willing to share the pdf? I'd love the pdf too, please! Thank you! I agree with everyone else, Great game! and if you are willing to share to TPT it, I would love it! a pdf of this game would be amazing! thanks! Oh man, if you ever do share a printable or sell a printable of this SIGN ME UP! :) Thanks for the idea! Thank you for sharing this! I am so excited to use it! I found it on your site! It looks great! If this is still available, I would love to purchase the PDF from you! Thank you, Anna! It is available to buy here: https://www.teacherspayteachers.com/Product/Middle-C-I-See-2578159 . If you don't have/want an account on teacherspayteachers.com, let me know and I will send you an email with an alternative.